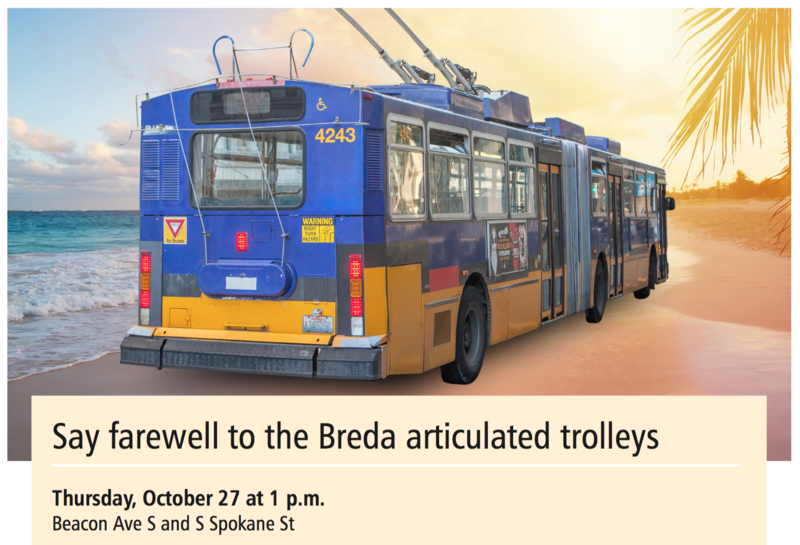 With the (60′) trolley replacement project now complete, the last of the Breda trolleys will take its final in-service ride tomorrow afternoon with a ceremonial trip from Beacon/Spokane to Atlantic Base. The lovably awful buses – dubbed ‘Frankenbuses’ by many – have a complicated and storied history in Seattle. Originally a “DuoBus” of electric trolley and diesel power, they began service with the introduction of the Downtown Transit Tunnel in September 1990, running as trolleys underground and where there was wire, and as a standard diesel bus otherwise. They were difficult or impossible to source parts for, and generally recognized to be a disaster. The imported Italian parts were so scarce and expensive that Metro began hiring sheet metal workers to make replacement doors themselves. In the late 1990s, nearly a third of the fleet needed an engine or transmission rebuild annually. Metro plodded along through their 12 year service life, eventually replacing them with the sort of diesel hybrids familiar to the tunnel today. Metro repurposed 59 of the 236 coaches as trolleys between 2004-2007, their diesel engines removed and their current collection system overhauled. As a Capitol Hill resident who moved here in 2009, they were all I knew until Link came along, and would be familiar to any recent rider of Routes 7, 36, 43, 44, 49, or 70. They were notable for their poor ride quality, their pavement-destroying weight (8 tons heavier than a standard bus), their frequency of dropped wire (Bellevue/Pine anyone? ), their distinctive musty smell, and their old-timey ‘Stop Requested” bell. But the fact that they lasted 26 years, and the amount of sweat equity put into them, has made many nostalgic about their sendoff. No matter how much we can justifiably complain about transit policies here and there, we should also recognize genuine progress and bullets we’ve dodged. We could have lost our trolley fleet after a 2009 audit found the aging fleet cost more to service and operate than running diesel hybrids instead. Thankfully Metro persevered and purchased a sleek new generation of trolleys, adding purple to Metro’s color palette and much-needed off wire operation to its bag of tricks. When I stand at Broadway and John today, I have a 2-minute subway and brand-new trolleybuses coming more frequently than ever. Things are getting iteratively better all the time, and it’s time to send the tired ones off. Metro’s event release after the jump. Metro’s last Breda articulated trolley will make its final trip after serving the people of King County for 26 years. Join General Manager Rob Gannon and others to celebrate the history of the Breda fleet during a retirment ceremony at the old Route 3 Jefferson Park terminal (Beacon Ave S and S Spokane St). After the ceremony, the last in-service Breda trolley, Coach 4243, will make a final trip to downtown Seattle before pulling into Atlantic Base one last time. switch to trolley mode—operating on overhead wire—for tunnel operation. 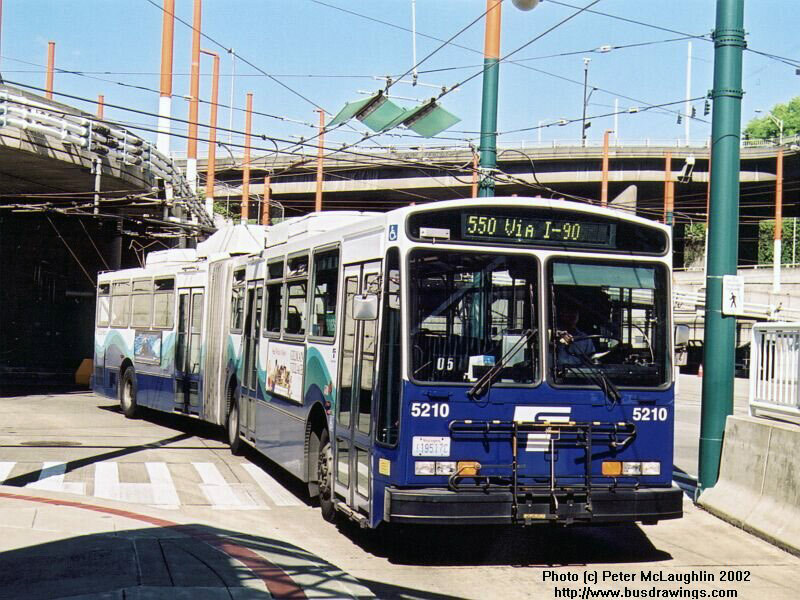 In 2004, Metro replaced the Bredas with hybrid buses that operated in “Hush Mode” through the tunnel as Metro and Sound Transit prepared for joint bus-rail operations. Metro, Link light rail and Sound Transit buses have been operating in the tunnel since 2009. After millions of boardings and miles traveled, we say “arrivederci” to a true workhorse of the Metro fleet. Those who operated or maintained the Bredas, or want to pay their respects, are invited to attend the farewell ceremony. Wow, has it been over 25 years?! I remember when these were new and the dual engines sounded like such a great idea, but true hybrids were still some years out. I hope 25 years from now I’ll be riding the opening of the ST3 line to Tacoma Community College and remembering how distant it all seemed back in the mid teens. You might not have to wait that long. FTA grants and all that…. ST3 assumes worst case financing. Federal funding speeds up timelines?!? That’s news to me. Thankfully Metro persevered and purchased a sleek new generation of trolleys, adding purple to Metro’s color palette and much-needed off wire operation to its bag of tricks. I don’t know about Seattle, but by far the best thing about the new buses is the retirement of the last of the high-floor bus fleet. No more worries about lifts breaking half-raised or the long wait for people to climb the stairs. KCM still has a bunch of Gillig Phantoms and some New Flyer D60s, so quite a few high floor coaches left. At least they had the right number of doors. When I drove for Metro, I probably spent more hours behind the wheel of Bredas (then with their diesel engines) than any other type of equipment in the fleet, because the tunnel-based 71/72/73 were my favorite routes to drive. They were just as bad as Zach says if not worse. The front brake system, a bizarre Rube Goldberg arrangement of hydraulic brakes with air assist that was more typical of World War II-era military trucks, was the most frequent pain point — but everything from the pole raising/lowering system to the doors to the oft-moldy climate control could and did keep buses away from their waiting passengers. I personally experienced two brake failures with passengers, a minor engine fire, a catastrophic transmission failure, and more trolley pole issues than I can count. But, just like unreliable Italian cars, they had their own charm. The “Ding!” bell was impossible for a driver to miss. The steering was exceptionally accurate, allowing a skilled driver to hustle a Breda around the city with dispatch despite the total lack of engine power. Visibility for the driver was excellent, both inside the bus and out, and there were fewer safety complaints than with newer equipment. The laggy, peaky nature of the Detroit Diesel engine’s power curve made the Breda feel more like an old Saab Turbo under full throttle. I was thrilled every time I got assigned a hybrid rather than a Breda, but in some way I’ll miss the old lumps. David, maybe the two of us should do a podcast exchanging driving memories and experience. But both the buses and the project itself really deserve a book, let alone a posting. The way we started a regional light rail system with dual power buses was probably he only really innovative US transit effort since the Second World War. Designing and procuring a whole fleet of experimental buses probably worth another book and a PBS special. But for medicine, mechanics, and politics all three, the smell our passengers have had to put up with since those buses went to the streets indicates death left to rot. 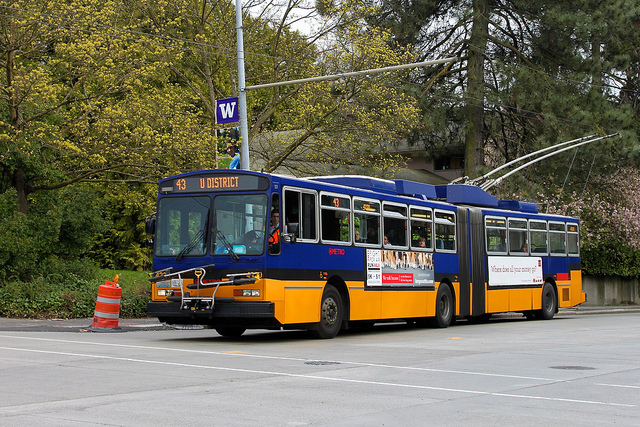 Politically correct, or incorrect, whichever our transit politics finds most insulting, if the 7, or the 49, or the 44 went through Bellevue or Kirkland, every one of those smelly junk-piles would have been taken down to metal. Cracked frames welded, the moldy floorboards ripped out, the panels replaced, and suspension finally installed. And knowing I wouldn’t have to burn my clothes after every single ride, I could have voluntarily set foot on one. Let alone miss driving it. Really?!? Farewell and full replacement of the Gillig’s completed too? Should have been clearer…for the artics. There are still some options left on the contract, aren’t there? I presume those would be used for the coaches needed for Madison BRT. The trolley contract has 23 options remaining, so there is potential to both acquire the coaches needed for Madison BRT as well as some modest trolley fleet expansion, for example if they electrify the 48. 4165, 4167, 4170, 4185, 4188, and 4198 are active right now. And, it seems, spending a lot of time on the 2. More than half my recent 2 rides have been on Gilligs even though only a few are left. Rode 4199 yesterday on route 36, and it was in good condition. Speaking of, it’s sad that route 36 isn’t seeing the new artics, and instead gets pairs of 40-footers. I guess the hill is too much to climb? What I recall hearing is that the artic trolleybus fleet isn’t large enough to continue serving the 36; Metro swapped those artics to the 70 instead. Given that the 36 is still one of Metro’s heaviest urban routes, maybe they should exercise some of those purchase options and put artics back on the 36. I remember these well as a UW student in the 90s… riding the often packed 71/72/73 to and from downtown. You could hear them coming a mile a way and I’ll never forget the sound of the engine straining to accelerate up any sort of incline (freeway onramp, up and out of CPS, SR-518 towards the airport, etc.). Breda’s products are still widely regarded as junk (the trains bought by the Dutch government to run high-speed to Belgium have been sitting idle for years while lawsuits about their quality continue). With that said, Seattle should take our experience with these as a lesson of what happens when we try to implement a costly out-of-the-box solution rather than doing what has successfully worked in other places for decades. Good thing the new rail cars are stock S70s and the region’s newest bus orders are pretty much all from New Flyer’s Xcelsior line. New Flyer has come down in quality over the years. In years to come the Breda will look twice as good as any New Failure product around as far as quality goes. YES. . those inclines. . you could hear those poor engines struggle on the 194 while getting on Hwy 518. Now instead, we get Link wobbling around the curve… but it’s moving! >Now instead, we get Link wobbling around the curve… but it’s moving! Um, that was me? Not sure why my browser autofilled the wrong name? lol, what the hell?!? lol. . oh wait.. my autofill has YOUR name now and email. Hmm. i’ll report this to STB. We can hope their quality improves now that they are owned by Hitachi. Ryan, name some of those things. One of my fondest transit memories is boarding a Breda trolley on a rainy day and slipping on the stairs, nearly hitting my head on the way down. A valuable lesson was learned: always climb those stairs with a firm foot. Yes, that is probably the best next stop bell I’ve heard. It isn’t shrill like the 1970s era Flyer coaches were, and it’s easier to hear than the electronic noise used on the New Flyer buses today. ..Hearing the 255 chug through the Juanita neighborhood 8 blocks away. ..When the driver left his seat after entering the south end of the tunnel, we all knew those poles didn’t connect. “Breda Costruzioni Ferroviarie” my question is if the Breda buses were so horribly faulty was Breda the only one who could do dual-mode buses? No offense meant to any Italians who hang out here but Italian vehicles seem to all have mechanical problems. The Fiat 500 is supposedly plagued with them. Neoplan was the other bidder for the tunnel buses but they failed to secure the required performance bond so it went to Breda. Neoplan dual-mode buses operate in Boston on the Silver Line. Boston’s dual-power Neoplans are junk, but not quite as much junk as the Bredas were. The MBTA Silver Line is a series of failures/broken promises/etc, but after their experience with the Breda LRVs for the Green Line I’m not surprised they would have gone with anyone else for the dual-mode artics. 1. Washington Street was promised “comparable replacement service”. It got something that isn’t even as good as RapidRide: no off-board fare payment, minimal lane reservations, etc. 2. The Washington Street service (now designated SL4/SL5) doesn’t connect to the Seaport service (SL1/SL2/Silver Line Way shuttle), except that the SL4 stops at street level at South Station so you can make an out-of-system interchange there. 3. The South Boston Transitway is a reserved right of way that is so badly designed that the buses often go slower than they would in surface traffic. 4. Upon exiting the Transitway to go to Logan Airport, the bus has to do a long loop maneuver to enter the Ted Williams Tunnel; there’s no tunnel-tunnel connection. Hahaha, come on. Ferrari, Lancia, Lamborghini, Alfa Romeo, Maserati, VM Motori, Magneti Marelli and if it’s not about car: Ducati, Ducati Energia, Comau, Teksid, Umbra Cuscinetti, Avio, Nuovo Pignone. “Fiat was the first auto manufacturer to patent a functional automotive variable valve timing system which included variable lift. Developed by Giovanni Torazza in the late 1960s, the system used hydraulic pressure to vary the fulcrum of the cam followers (US Patent 3,641,988).The hydraulic pressure changed according to engine speed and intake pressure. The typical opening variation was 37%. Some of those companies made more than just autos. Variable valve timing just makes an internal combustion engine more complicated than necessary. It’s an attempt to improve fuel economy and keep speed and acceleration. Most cars built according to that design parameter are unsafe on the road. Cars built to conserve fuel, especially hybrids, are inherently safer. Transit patrons are at first walkers; the safer the walking environs, the greater the transit patronage. That said, the new model bus chassis are built for high-speed and least stop-n-go operation; NOT for hill-climbing where a trolleybus is ideal and especially when designed for that purpose. Thus, the new trolleybuses are Metro’s way to keep Seattle transit up to mediocre standards. Joseph, in 1983, after the two Forward Thrust elections had failed, Metro decided to build in phases the regional transit system that the first two proposals planned to build whole. Three immediate pressures. One, the new system needed a state of the art light rail subway through Downtown Seattle. Long before we could afford to extend railroad track on a single corridor outside the Tunnel. Two, we had it on good information that given the Downtown building boom in progress, somebody had already filed papers for a skyscraper whose foundation would make our subway impossible to build. And three, Seattle’s every surrounding suburb would have to help pay for. Given the lack of the existing rail right away that other light rail systems inherited, their voters would have to agree to pay for a subway whose first train would leave Bellevue…what’s projected date now? Surprisingly, the suburbanites agreed to a fleet of buses that could run diesel on the freeways, and electric through the Tunnel. These are the reasons we had to come up with the dual power buses. Fast. Thirty years ago, transit had little if any hybrid. And the world had even fewer dual power buses, and fewer that could run freeway speeds on diesel. Worldwide, we got three bids. MAN, from Germany, as expected, high. Breda, middle. Low bid was far and away the best bus. Neoplan, a German company headquartered in Colorado offered, and let us try out, a standard articulated bus with interesting propulsion package. Electric motor powering center axle. Powered by line current under wire. Powered by the diesel on the highway. Mechanics loved them. But weirdly, especially considering their international profile, Neoplan refused to enclose the performance bond the specs explicitly required. Reason never even disclosed by rumor. Which is how we got the Bredas. Whose delivery we could’ve refused for all the specs they never got close to. Leaving us with problem of how to give the suburbs the system their voters had been promised until we did another whole procurement. Meantime fighting Breda in court for breach of contract. A Congressional to our mechanics for 25 years’ service for building an unprecedented transit system in the face of paralytic disgust. Also for re-manufacturing 236 rubber-tired wrecking yards into a fleet of buses. Also to our drivers, many of us either committed enough to this country’s only real transit innovation since World War II to indeed make a transit system out of them. Or who used them to sharpen our own driving skills. Labor and Industries demands tests to be sure nobody normal ever gets under wire. Anyway, operations and training are for another whole post, especially the second, which has always been DSTT bus operations’ worst defect- buses included. And still another one discussing what lessons this whole project and its approach have for the future. Best indication of the value of this phased approach is that after, indeed, thirty years awaiting rail, none of the original suburbs have bailed out of Metro. So we’ve at least got some unusual proven tools in the kit for ST-3. Mark–You said, of the competing Neoplan bus: “Electric motor powering center axle. Powered by line current under wire. Powered by the diesel on the highway.” Do I understand correctly that you’re saying the diesel drove a generator to power the same electric propulsion motor on the highway, similar to a diesel-electric locomotive (essentially a series hybrid)? I’m very curious because when I first moved here and encountered the Bredas, I just assumed that’s how they worked, because 1) That’s what I would have done if someone asked me to design a dual mode bus, and 2) Breda was, after all, a locomotive manufacturer that had never designed a bus before. I was quite surprised to learn, years later, that the Breda had two wholly independent drivetrains powering different axles! Also, you said that MAN, Breda, and Neoplan were the only bidders, and other versions of the story in popular mythology say that Breda and Neoplan were the only bidders, but I swear I’ve seen a photo of a Renault PER180 dual-mode bus in Metro colors–did they not also bid? Can you shed any light on the back-story there?? Where do these Breda buses (and other Metro coaches no longer needed) go to retire? MEHVA saved one. Some were scrapped. Others were used as parts coaches and will probably be scrapped. Many buses are also auctioned at the end of their life with Metro and often go on to be used elsewhere including other transit agencies and private companies. Repurposed and plopped in a rare vacant lot, they would make an amazing hipster bar hangout on Capitol Hill with authentic local flavor. If Atomic Taco can have “A Taco Truck on Every Corner” is it too much to ask for a Pizza Bus as well? Several of the Taco Trucks in my area are old school buses, and there is one that appears to be an ex London double deck Routemaster. So the Breda Bar concept isn’t too far off. 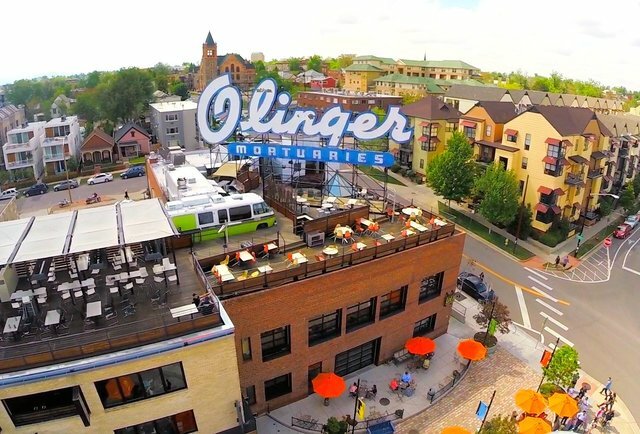 I can just picture it with picnic tables in front, string lights overhead, a Breda and a Gillig parked in a lot, many taps of local craft beer, artisanal cuisine and the 80s classic “Electric Avenue” playing. Last week, I saw a retired transit bus at a haunted house. It looked pretty decrepit. Someone get poncho some capital! Even if you ran it through an electric furnace, Elbar, the Health Department would nix it because of how much mold is still left. Though Routes 7 and 44 (looks like something out of a dice game with human bones, doesn’t it?) may have left enough traumatized victims for a mob to come screaming out of the Ark Royal and tear City Hall apart demanding censorship. Meantime….dammit, didn’t those guys on YouTube tell you I don’t need anymore sugar cane cut for my coffee? Try that diner over there. No, I don’t like the way it smells either! If they’re Bredas, maybe they should be serving artisanal toast. Some of the components can be used on Gilligs until they retire. Some are historic, the rest are crushed. There are too few trolley systems in North America. And these were not conventional trolleys. They are scrapped somewhere near Tacoma. I saw one once. Wait, the 3 used to go to Beacon Hill?!? Yep, you can see it on the 1963 trolley bus map from SDOT. It went from Raye St down to Spokane St via S Jackson. What we now call the 3 was the 12 back then. So regular weekend trolley service now? Hardly. I still see lots of D40LFs running around on the weekends. Better check your aim, Poncho. The People’s Republic of China isn’t going to like having the Forbidden City blasted into orbit from underneath by the trajectory of a mortuary pushed through the world by the weight on its roof. I selfishly loved it when a 49 would drop wire at Bellevue and Pine, since that meant I could scurry out closer to my apartment than the actual stop. All I gotta say is I loved the seating arrangement on these things (actual legroom for tall people). The new trolleys being rolled out are so uncomfortable to make me think twice about actually riding at all. It’s like they didn’t even use people to test out the arrangement. Fleet Numbers Trolley Conversions 4200 – 4255?? Computer Control under Passenger Seat Left Side # 2 Axle, Failed when Person weighing over 250 Pounds sat in seat!! Mechanic Lingo/Terms – IFM, WTF its a BREDA! Poor Performing Coach Have Lemon Decal Affixed to Right Front Of Coach…. They begged me to drive a BREDA coach into tunnel to pick up passengers reason no qualified operators! Wife called the police because I failed to come home….listed as missing person for 4 Hours! In Dog Years the BREDA is a very old coach only GM TDHs from 1955 were older and they ran better! I lived near the old 72 Terminal in Lake City 4 Blocks away, Late at night or early in the morning could hear BREDA coach start up !!! BREDA coaches purchase at the request of City Seattle….because they thought diesel coaches in the tunnel would be terrible! Are the Bredas thinner than most of our newer model buses? I’ve always thought they seemed more appropriately compact (i.e. european) than the newer Chevy-Suburban-American-Style buses. Wow 26 years… I’ll miss being a passenger on those buses… How loud the diesel engine was, you’d know if you missed your bus or not; the air release when the doors opened (POW!!! ); the bell, the Fiat type horn, and in the later years, how you need an umbrella inside the bus when it rained, and when you’d hit a bump and the aisle lights would flicker or go out completely. And that beeeeeeeepppp when it would drop the wire. My favorite experience was when riding the #8 on John, a 43 was in front of us and came off the wire. That operator got it back on, and took off. Our driver popped the brake and got out, came back with the back window of the 43 bus. Must have been why the wire dropped. After calling in the other bus waited and he gave back the window.